We have won a few awards along the way but that is not our motivation. Some of the awards we have picked up are mentioned below. Our After-School club [Stay and Play] were delighted when we were chosen by Eircom to receive their Digital Boost prize. The prize consists of a custom built app to help us organise the collection of afterschoolers. Eircom were impressed at the level of service and flexability offered to our parents and took a great interest in our service. Stay and Play are now the only service in Ireland with a custom built app. Little Learners were the proud winner of the Early Childhood Ireland Innovation Award in April 2015. The award recognises innovative ideas and practises within the early education sector. Our award was achieved by our loved friend and colleague ' Ted ' the school teddy bear. Ted is an important part of our Pre-School and our childrens lives. Our unique approach to story telling with our Story Tree and Story Pot has been showcased as an example of best practice by Barnardos and Dr Geraldine French.It is featured in text books used in Early Childhood Studies. 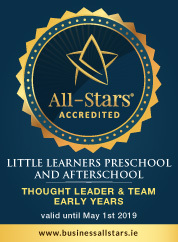 Little Learners received a client award for small business improvement in March 2015 for our business model.